Thread: Non polarity cap questions on CRT monitor repair. So I was given an apple II monitor model A2m2010. IT was in pretty rough shape. After a preliminary cleaning and inspection I decided to power the unit up. I did get raster but there was a very high pitch sound. I discharged the CRT and figured it might be a faulty capacitor as I have come across that before. Once I got the board out i noticed in fact a lot of caps had leaked... probably along time ago as there was no "wet" electrolytic instead solid "crusteez" under the caps. I replace the main culprits and the high pitch is almost gone although the image isn't correct yet; I can see images across the screen when I type but they are stretched and illegible. Looking on some schematics online i found that one of the caps Id like to replace is a non-polarized electrolytic cap. C420 is a 16uf 25v c420.jpg The strange thing is the cap is huge for such a small increment. I'm just uncertain about which cap to buy to replace this thing with. Could someone shed some info on these non-polarized electrolytic caps? 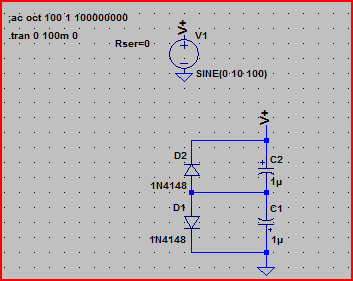 Although, I've never done so, you can make a non-polar capacitor from two placed in series of opposite polarity. I'd guess you'd need to use values of 2X capacitance but of equal voltage. In this case 25V each. Hey Dwight. So if I am understanding you. I can take two 16UF 25V (or are you saying 32uf) caps and connect them together positive to negative leg. Then connect the remaining positive and negative [unconnected] legs to the appropriate through holes and that would work? Since the caps are in series, you need 32uF, and the hookup is - to -, leaving the two + to go into your circuit. Personallly, I don't like the arrangement. I'd rather use a single film capacitor (which is nonpolar). I find that sometimes this works. In theory, it always works. But in theory, capacitors are perfect insulators. Like Chuck, I'd opt for a non-polarised capacitor in this (and most every such) case. If you do series them, they must be each twice (32uF) the capacitance of the original. This nets a single capacitor with half (16uF) the value of the individual capacitors. What Chuck and Space Commander said. I also use film caps. Nonpolar/bipolar electrolytics don't seem to age well. I keep a variety of largeish film cap values on hand and just parallel them to make whatever I need. Also note that in this arrangement, the ESR is doubled. Not so good. A polyester non-polar is inexpensive and will do the job. I suspect that there may be linearity issues with this setup, but I don't see where it would be awful. Thanks Guys this is all very insightful. I am sensing the caps-in-series solution may be best as a last ditch. I suppose I will look for a polyester film alternative. Just to ask, why was the electrolytic cap 5 times the normal size of what a polarized electrolytic cap would be?